Four retired teachers from the Grand Island school district (Sandra Wolgast, Trudy O'Connor, Sandra Marcussen, and Marie Kronenwetter) have done some traveling in recent years. 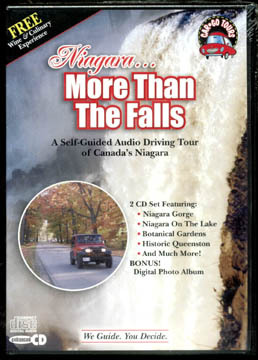 Noticing that audio driving tours are quite popular in places such as Gettysburg, Pa., and Santa Fe, N.M, they wondered: Why not create one tailored for the Niagara Region? Niagara ... More Than The Falls lets you explore Ontario's beautiful Niagara Gorge region. The audio tracks give directions, historical background, and general information about each of the 19 sites. Formation of the Falls, the Great Gorge, gardens, War of 1812, wine, the story of power, and tales of adventure seekers are a few of the themes you will explore along with the magnificent scenery. The CD's are narrated by Tom Donahue, veteran radio personality and Associate Professor at Buffalo State College. With the flexibility of the CD, the car can easily take a detour for lunch or a break. With the different tracks, the tour could be taken in one long afternoon or divided over many days. The tour covers places that Winston Churchill once described as, "the prettiest Sunday afternoon drive in the world." Whether you desire some serious hiking or a leisurely view of the natural beauty, you set your own pace. The CD set comes with the map, directions, and two sheets of coupons that are pertinent to the tour.